We are more than half way through December, Christmas is around the corner, the New Year will soon be here, my guest spot at One Story Down will be over, and Scrapflower will be closing it’s doors forever on December 31. Wow, what an end. 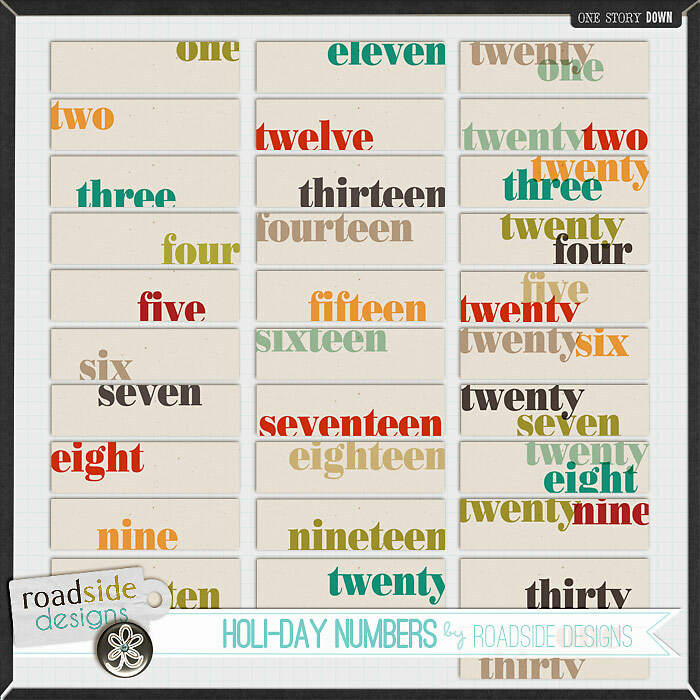 Well, you are probably all wondering what my plans are for Roadside Designs, right? I have found a new home, a home that I feel is a perfect fit, and a fresh new start to the new year. I am not telling yet where I will be going and you all can guess all you want, but until January, it will be a secret. I will be taking a small break the first week of January to stock my new store AND I am NOT taking everything with me, so if there is anything you may want, get it now before my Store at Scrapflower is gone. In the meantime, you may see a few fresh changes, as I am doing some blog redesigns, logo redesigns, and product redesigns. 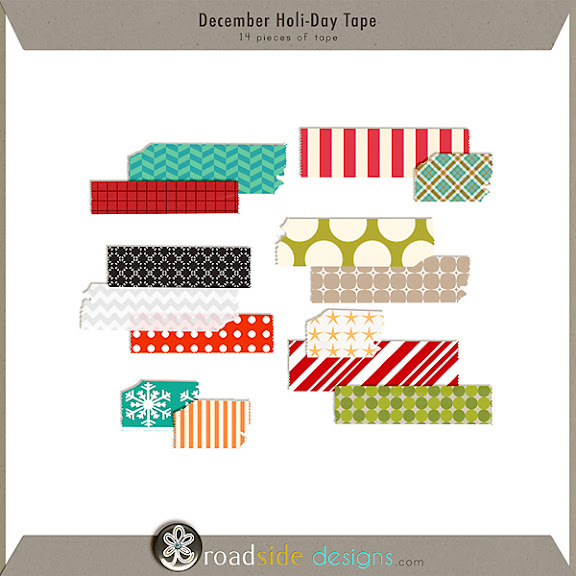 If you don’t want to wait for the 31 Days of December templates, they are still in the store too. These templates are available at One Story Down. I am also offering for sale a 6 x 8 size. The download link will only be available for 24 hours. So be sure you bookmark this site and check each day for the download. I will try and have the download up each day at Midnight EST. 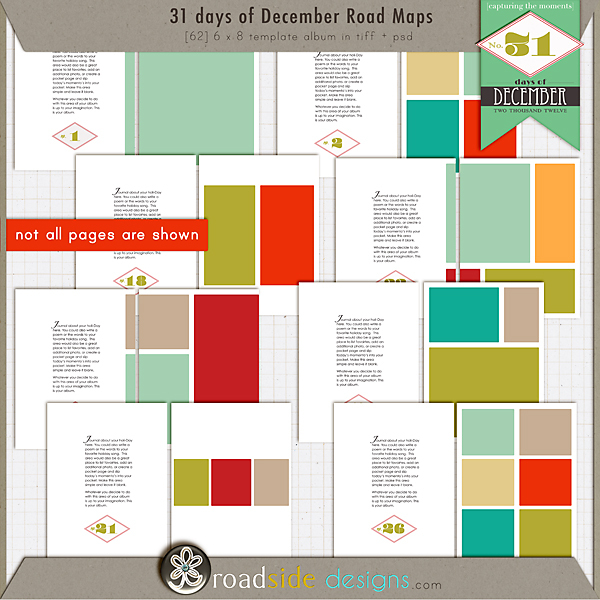 AND when you have done a page or two, be sure you share your layouts with the rest of us and upload to the Roadside Flickr Group! Thank you for day 21. Scrapflower sure didn’t last long! Thank goodness you have found a new home. I love your scrap maps and look forward to seeing where you end up! Happy Holidays to you & your family! Thank you so much for all these templates!!! Can’t wait for your new shop announcement. Thanks again! I keep missing a day LOL! Is scrapflower really closing………??? I heard it was saved? I’ve had my eyes on both your Travel Album and Travel Journal templates for a long time. Finally pressed the “buy now” button on both since these look like they’ll disappear as you open your new store. PLEASE make some new templates in a similar style. I really like the “newspaper” style with the two columns and room for plenty of journaling. Makes it so easy to DOCUMENT a trip or an event.